More on Intelligent Design from its chief proponent, who trots out even more minutiae on the “irreducible complexities” of cells and their parts previously discussed in Darwin’s Black Box (1996). There are some additions and subtractions. Now Behe (Biological Sciences/Lehigh Univ.) readily concedes evolutionary modification through descent. Species were not created separately as creationists hold, he writes; DNA evidence indicates descent from a common ancestor. He also admits that random mutation can account for some useful genetic changes, such as the development of the sickle-cell trait to protect against malaria and the malarial parasite’s evolved resistance to chloroquine. But he denigrates these changes as essentially weakening genomes. If random mutation is so good, Behe goes on to ask, why hasn’t the malaria parasite developed defenses against sickling? This question ignores the fact that the organism as it exists right now is enormously successful. 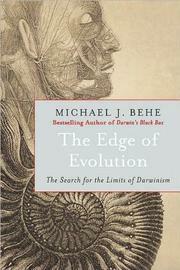 The text repeatedly casts Darwinian randomness as powerless or trivial in the face of the dizzying probabilities required (at least according to Behe) to generate the bacterial flagellum, a cell’s cilium, assorted protein-protein interactions and all the critical developmental events that transform egg into baby. The author agrees that there are ways in which genomes can change more than one nucleotide at a time, but ignores Stephen Jay Gould’s punctuated equilibria or such events as the incorporation of a bacterium into a primordial cell. Nor does Behe adduce any experiments that could be performed to demonstrate Intelligent Design. What we have is a sophisticated version of William Paley’s watch needing a watchmaker, with the author quoting respected scientists on the wonders of nature that have led some to invoke the anthropic principle or the existence of “multiverses.” Behe opts for a designer—not necessarily God, though for him, as a Roman Catholic, it is. Not science, but a tract to comfort those who want to believe.